Unique Paddlock design allows the option of interchangeable blades and shafts. Connections lock down tight with allen wrench tool. A 4-piece paddle that feels like a one piece paddle. 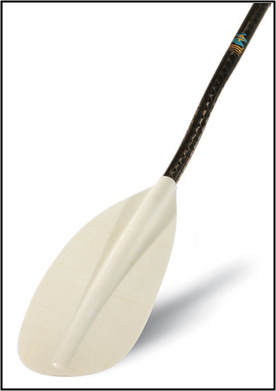 Use our Lendal paddle builder to get exactly the paddle configuration you need. The AT4 brings top-shelf performance to the masses thanks to new aerospace materials combined with our advanced molding techniques for outstanding durability. Carbon fibers are bonded with fully-recyclable N6 resins, producing the strongest whitewater paddle on the planet�this paddle can take a beating. Length; 190cm (small diameter shaft) or 194cm (standard diameter shaft). Shipping to 48 States only. The AT4 brings top-shelf performance to young paddlers thanks to new age aerospace materials combined with our advanced molding techniques for outstanding durability. Woven glass fibers are bonded with fully-recyclable N6 resins, producing the strongest whitewater paddle on the planet�this paddle can take a beating. 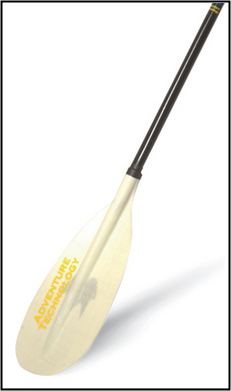 This is the best fiberglass whitewater kayak paddle for youth paddlers. 175cm OR 180cm (small diameter shaft just right for youth paddlers). The Rage has a sturdy Fiberglass shaft with a Fiberglass-reinforced, nylon blade, this makes it light but very tough with more reinforcements and thicker blades than our standard paddles. Made in USA. Blade offset: 30° feather angle. Available in 195 or 200 cm lengths. Color: Sage Green blades, black shaft. Our top of the line Rage paddle upgrades to a Carbon fiber shaft with Carbon-reinforced, nylon blades, this makes it extra light but still very tough with more reinforcements and thicker blades than our standard paddles. Made in USA. The Rambler is our general purpose, do everything paddle for lakes, streams and rivers. The Rambler is a very durable, to get you there and back type of paddle. Fiberglass/nylon blades are rugged and maintenance free. The fiberglass shaft is sturdy and light weight with good balance. 2-piece shaft design features a snug fitting and trouble free ferrule which offers 0° or 60° feather angles. 2-piece paddles stow easily in your car OR even in your kayak for use as a back-up paddle. Our 210cm size is a great choice for crossover paddlers who go in rapids, creeks and flatwater. The Werner Rio FG IM offers an advanced river running blade design at an introductory price point. Mid size blades are so well balanced and easy to use that we highly recommend the Rio for all entrants into whitewater who demand great paddle performance. Fiberglass reinforced plastic blades with advanced river running design. Fiberglass shaft is carbon reinforced. The Werner Desperado CF IM offers unrivaled paddle performance at a price that should be outlawed! With mid size carbon reinforced nylon blades and our premium river running blade design the Desperado is light weight, well balanced, easy to use and durable. The smart choice for entrants into whitewater who demand performance. Carbon reinforced plastic blades are light, stiff, and durable. Advanced river running design is well balanced and easy to use. Special back features are cool and add blade stiffness. Premium Carbon-Fiberglass blend shaft has legendary bomber strength. 45° feather angle • One Piece composite shaft.